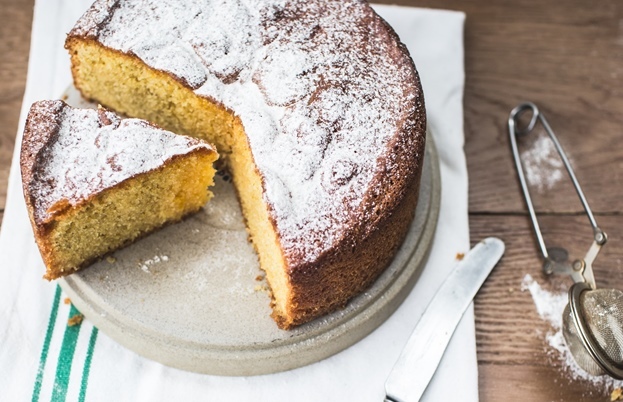 A simple dairy- and wheat-free lemon cake that you'll return to again and again. You don't have to stick to lemons with Izy's recipe; orange zest and juice are also perfect here! Plus any seasonal fruit compote would work well as a topping. Over the years I’ve made many iterations of lemon cake. Pound cake with poppy seeds, snacking cake with streusel, layer cakes with buttercream and this flourless lemon cake. I do appreciate a nice towering lemon cake, generously frosted with tangy icing but this simpler, slightly rustic cake is one I return to again and again. Don’t think that you have to stick to lemons with this recipe though; orange zest and juice are also perfect here! 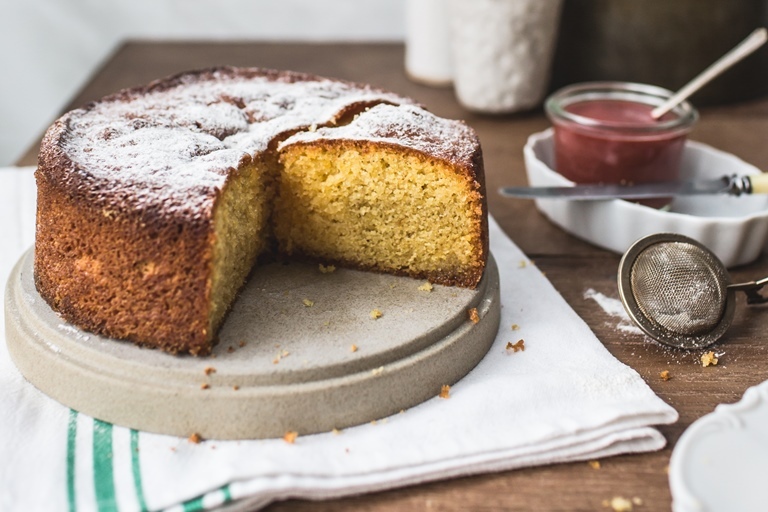 Using fine cornmeal adds a slightly toothsome texture to the cake whilst the ground almonds keep it moist. Folding in billowy egg whites ensures that the cake has a light texture but the soaking syrup (poured over post-bake) gives a slight sheen and lemony dampness to the crumb. 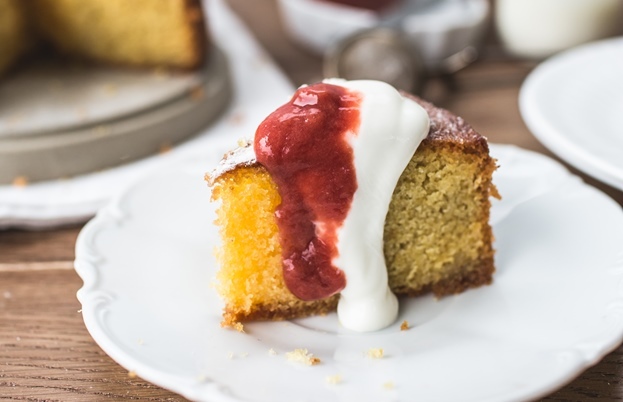 I served it with a bright and tart rhubarb coulis as the forced variety is just coming into season now and I couldn’t resist! If rhubarb isn’t your thing, go for blueberries or raspberries as they still have tartness which matches that of the lemon. Otherwise a dusting of icing sugar and maybe a dollop of whipped cream or yoghurt will suffice!